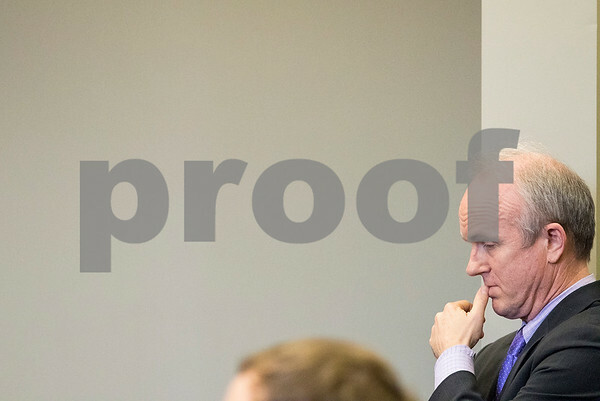 Former DeKalb County State's Attorney Clay Campbell listens to Jack McCullough's lawyers Gabriel Fuentes and Shaun Van Horn of Jenner & Block speak to DeKalb County Judge William Brady on Friday, April 1, 2016, after they filed a motion Thursday requesting Judge Brady vacate their client's murder conviction or release him on bond. Judge Brady denied both motions and McCullough will appear in court on April 15. Campbell oversaw the prosecution and conviction of McCullough in 2012.